AUD was weakened due to the Australian consumer inflation data and dovish talk from a Reserve Bank of Australia official. 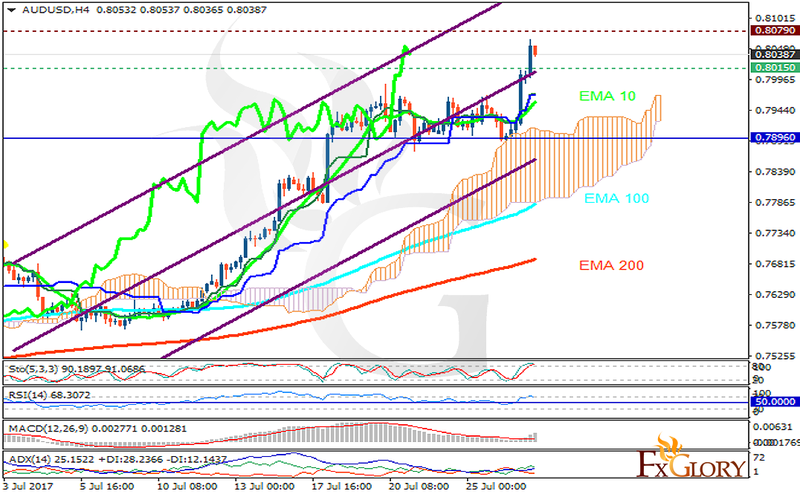 The support rests at 0.80150 with resistance at 0.80790 which both lines are above the weekly pivot point at 0.78960. The EMA of 10 is moving with bullish bias along the ascendant channel and it is above the EMA of 100 and the EMA of 200. The RSI is moving in overbought area, the MACD indicator is in positive territory and the Stochastic is moving in high ranges. The ADX is showing buy signals. The price is above the Ichimoku Cloud and below the Chinkou Span. The Tenkan-sen and the Kijun-sen are both showing an upward trend. Despite the bullish signals presented by the indicators, it seems that the resistance area is too strong to be broken therefore short positions are recommended targeting 0.78.